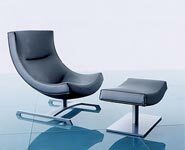 Below is a list some of the best italian contemporary furniture we can find. If you know much about modern and contemporary furrniture you well know that on the most part the italian's are the one out putting the bigest and in my opinion the best contemporary furniture. Below is some hand picked italian contemporary furniture. If you know of any other worthy italian furniture you feel should be listed on this site then please drop us an email using the contact us link on your left hand side. We are happy to review any furniture items that you may suggest..
Cassina is one of the most amazing brands of furniture in my opinion. The name of the brand is not to dissimilar to how wine in Italy are named, cassina furniture is from “cassina” a small town in Italy. World famous for its style and just the simple fact that it’s a massive Italian furniture brand. Below I have selected one of my favorite pieces of Italian furniture. 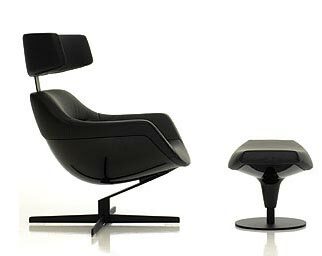 The Swivel armchair by cassina has a fixed base with the addition of a perfectly formed footrest. Not only style but comfort comes from the armchair as if offers 8-height positions for its headrest. More Cassina furniture, our main theme for this page. We have selected some of the best contemporary chairs we can find.